The replacement of the Trident missile system cannot be justified on moral, economic or defence grounds. That's the conclusion of a new report launched in the Scottish Parliament today by the Jimmy Reid Foundation. The moral and philosophical case against renewal is well understood, even by those who support Trident replacement. Inherently indiscriminate nuclear weapons can never satisfy the just war principles of discrimination and proportionality. There is also a defence case against renewal; one increasing supported by former defence chiefs and others who recognise that the massive expenditure on Trident is at the expense of conventional defence. Equipment and resources that are needed to address real threats to our security, rather than a vanity project maintained largely to maintain a seat at the UN Security Council. Important those these arguments are, the strength of today's report is in making the economic case against Trident renewal. The often vastly inflated claims of job losses are carefully debunked and the report calculates that some 600 civilian jobs are dependent on the existing Trident system at Faslane and Coulport. The replacement of Trident will cost at least £205bn - a figure that is likely to go up with the weaker pound (as much of the spending goes to foreign companies) and the normal cost drift of defence programmes. That means every Trident job costs £18m. We also need to recognise the opportunity cost of spending £205bn on other public services. With more than 30,000 devolved public sector jobs lost in Scotland since the crash, these resources would provide many more jobs and services that people really need. It could also boost real manufacturing jobs in the UK, rather than transfers to banks and foreign multinationals. As trade unions we cannot argue the indefensible, simply because it has job implications. What we have to do is to minimise the impact and negotiate a just transition to other work. It might be argued that this is easy for a union with no members linked to Trident replacement to make. However, there are other policy areas where we have taken just such an approach. For example, we are in favour of public ownership of the gas and electricity sectors, a policy that would result in the loss of sales jobs in the industry done by UNISON members. Our approach is not to defend the obvious waste in the current system, but rather to make the case to transition our members into more useful and more satisfying work. In this context, the report calls on the Scottish Government to establish a Scottish Defence Diversification Agency, whose main focus would be the planning and resourcing of jobs away from Trident. The report outlines how this could be done and points to case studies from other parts of the world. Spending staggering sums of public money on a useless weapons system cannot be justified at any time. However, given the current state of the public finances it is beyond indefensible. The strength of this report is that it focuses on the economic case against Trident replacement and offers a just transition for those who may be impacted by non-renewal. Their skills are much needed elsewhere. Today’s Autumn Statement failed to live up to the rhetoric. There was little for those who have suffered the most from austerity and nothing for our beleaguered public services. The main significance of the Autumn Statement for Scotland is the impact on public spending. Under the new devolved powers the Scottish Budget is made up of the Barnett formula, less the Block Grant Adjustment, plus devolved tax changes agreed by the Scottish Government. This means the Barnett formula remains an important component of the Scottish budget and is based on a proportion of English spending on devolved services, like health and local government. The Barnett consequentials of today's Autumn Statement are an additional £800m for Scotland. Sadly, this is less attractive than it sounds because it refers to capital spending. While capital spending is welcome, including the City Deals, we have to recognise the significant leakages it has from the Scottish economy. In contrast, revenue spending is much more likely to be spent on the high street. The departmental revenue spending plans remain the same, which means we are still facing substantial cuts to services over the next three years - up to £1.5bn, most of which the Scottish Government is likely to pass on to local government. There was no hoped for increase in English NHS or social care spending, which would have had positive Barnett consequentials. This all means a tricky Scottish budget for Derek Mackay MSP when he sets out the Scottish Government's spending plans on 15 December. Other announcements today that impact on Scotland include an increase in the so called National 'Living Wage' from £7.20 an hour to £7.50 from April next year. This only applies to those over 25 years of age and is not to be confused with the real Scottish Living Wage, calculated based on what people need to live, which has recently been increased to £8.45. There is an increase in the lower income tax threshold to £11,500 that benefits higher income taxpayers as much as the low paid. The same applies to the higher rate tax thresholds and the previously announced cut in Corporation Tax. As IPPR argues, this tax cut for the top is the wrong priority. There is also some modest relief for low paid members who will transfer to the new Universal Credit benefit, because the taper rate is to be cut from 65% to 63% from April next year. The economic forecasts in the statement are generally gloomy. Growth forecasts are down, debt and borrowing will rise, in a large part due to Brexit. There has been a relaxation from Osborne's unachievable targets, but as the OBR says, it isn't going to be easy to balance the books in the next parliament either. Ageing along could add 0.8% of GDP by 2025/6. All of this shows that austerity has failed dismally, yet the UK government ploughs on regardless. The OBR has identified delayed investment since Brexit along with inflation as the big driver of lower growth, only partly offset by export opportunities from the lower pound. In a separate announcement today, the ONS released their post-Brexit population forecasts for Scotland. This chart shows how population growth will be much slower in Scotland and that has economic consequences as well. The more informative OBR forecasts offer little cheer. Wages will be £1000 lower in 2020 than the government predicted in April. Overall, as Jeremy Corbyn puts it, "This is what happens when government and the economic model it's relied on for a generation fails to deliver". The causes of poverty and inequality are well understood, we now need to have the difficult conversations about taking action. All this week, BBC Scotland have been running a series of features under the heading Unequal Scotland. They have looked at education, health, life expectancy and income. This fairly describes inequality and the impact it has, not just on those most impacted, but also the economy and everyone in Scotland. As Douglas Fraser explains, this issue is being given a lot of attention by those in power, including heads of government, central bankers, the International Monetary Fund, even the Davos gathering of the economic elite. Nicola Sturgeon has put the tackling of inequality alongside economic growth as her twin priorities. Even a Tory Prime Minister has targeted her political message at those "struggling to get by". Describing inequality is something we are very good at doing. Taking real action is more tricky, primarily because it involves some difficult conversations with those of us who are not in poverty. A good example of this is highlighted by Gideon Calder from Swansea University. His research asks, is it okay for parents to pass wealth down to their children? So the kids gain a house when mum dies, for example. And before that, get everyday benefits just because their parents are relatively well-off? He concludes that we are not willing to have this conversation because the 'family' is sacrosanct. The First Minister's poverty tsar touched on a similar point with her call for increased taxes, not least by addressing inheritance tax. She also picked on tax increases for the richest and the need for a progressive council tax - something the Scottish Government has ducked yet again. She said: "When people say they want a really wonderful NHS they don't say I want to pay more taxes for it. Well, I'm afraid you cannot have a really wonderful NHS unless you are willing to pay more taxes for it." However, her most telling comment was that she was not convinced governments would raise taxes to the levels needed. She said: "You [governments] can always go further but you'll always have your eye on the next election and what people can expect". This goes to what I call Scandamerica, the idea that we can have Nordic levels of public services without most of us, not just the very rich, having to pay more taxes. Remembering that we now have the powers to address this in Scotland. The Scottish Government is currently consulting over what a Scottish social security system should look like. This is important because some 37% of benefits will be devolved to Scotland, when you exclude pensions. However, as Govan Law Centre and others have highlighted, the consultation is almost entirely about process, not about adequacy of benefits, a crucial element of any strategy for tackling income inequality. This theme is also covered by the tax lawyer Jolyon Maugham QC who points out that this year we’ll collect around £170bn of income tax, but forego through reliefs about £30bn of income tax - almost £500 a year for every man, woman and child in the UK. He says these reliefs go overwhelmingly to those who need it least, the inevitable consequence of two deliberate policy choices: to distribute that £30bn through the tax system and to fail to monitor what good it does. Tackling these reliefs would include some difficult conversations on issues like ISA's and tax relief on pension contributions, which are valued by middle income groups. Perhaps his most striking statistic is that the highest earning 15,000 taxpayers, almost 0.05% of all taxpayers, netted 5.5% of total deductions and reliefs. Most will have seen six figure reductions to their income tax bills. This isn't just a parochial issue for us in Scotland and the U.K. As Thomas Piketty argues in the Guardian this week, Trump’s victory is primarily due to the explosion in economic and geographic inequality in the United States over several decades and the inability of successive governments to deal with this. Fiona Buchanan from Christian Aid makes a similar point in relation to the developing world, also highlighting the issue of gender justice. There are some serious attempts at developing a consensus around some solutions. The IPPR's Economic Justice Commission is one such initiative. Their background paper makes the point that for all the rhetoric about a strong economy, it isn't an economy that works for all. Half of all UK households have seen no meaningful improvement in their incomes for more than a decade. The JRF's 'Talking about Poverty' project also points the way to a better understanding of the solutions. So, hats off to the BBC for doing what a good public service broadcaster should do - educating us on probably the most important issue of our time. However, we need to move on to some, often uncomfortable solutions. Tackling inequality is in all our interests, because more equal societies do better on every count. This means we all have to contribute to the solutions, and yes, it will cost us. Council borrowing has come under scrutiny with a call from the Scottish Greens urging the UK government to write off what they describe as "unethical" loans made to councils in Scotland. This is similar to Unite the Union's, 'Scrap the Debt' campaign. The response from the UK Treasury was a predictable - no chance. That doesn't mean the campaign call isn't justified. After all there is precedent with housing stock transfer, albeit that was to achieve a specific, if flawed, policy objective. It is also important to understand that councils have been borrowing from the Public Works Loans Board at rates well above the cost to the Treasury. In effect this has been a nice little earner for the Treasury. I understand the campaign reason for the analysis by the Scottish Greens that councils are typically spending about 42% of the money raised by the council tax locally on servicing debts. However, this is misleading as only 15% of council revenues now come from the council tax, largely as a consequence of the regressive council tax freeze. Commentators often erroneously explain council borrowing by making comparisons with personal finance. It has to be understood that councils are under a legal obligation to produce a balanced budget. They do not borrow money simply to pay for the running costs, this is for capital spending on schools and other services. The exception is PPP schemes, which are funded from revenue, at exorbitant cost. As the Treasury is going to ignore this call for debt cancellation, we need to look at what else councils and the Scottish Government can do to reduce the debt burden. Following a call by UNISON Scotland, the Scottish Government has relaxed the rules governing loans funds, giving councils greater flexibility. This could save councils in Scotland as much as £50m. Councils should also be looking at their borrowing books and refinancing the older debt, in a similar way individuals shop around with their mortgages The interest rates on some of this debt is way above current rates. The primary constraint is that some councils unwisely signed up for punitive repayment penalties. The worst, but not the only, example of high exit fees is the Lender Option Borrower Option (LOBO). As ex Barclays Capital employee Rob Carver put it: “You just need a Bermudan swaption pricer to know the relevant volatility surface, some kind of interest rate model calibrated to the appropriate processes and the full forward and spot curve". Understandably, not skills present in most council finance departments! The other option for replacement and future loans is using bonds. Something that used to be commonplace, but has gone out of fashion. Around 60 local authorities in England and Wales have joined together in the Municipal Bonds Agency, which has the express aim of reducing council’s capital costs by arranging loans at cheaper rates than the PWLB. The English Local Government Association, which worked to set up the agency, estimates council savings on financing costs over 30 years could be as high as £1.45 billion. They have already forced the Treasury to cut PWLB rates. Scottish councils have sadly been very slow to consider this option, the recent exception being Aberdeen City Council. In our 'Combating Austerity' report we calculated that councils in Scotland could have saved between £270m and £337.5m over 30 years by issuing their own bonds. Councils and health boards should also be robustly monitoring and restructuring/refinancing their PPP schemes. Refinancing usually requires the approval of the Scottish Government, who have been slow to do this, although the SFT are looking at a few schemes. I suspect part of government's reluctance is that a major use of refinancing requires the cooperation of councils using their prudential borrowing powers. Better progress is being made with monitoring contract performance. There was some speculation ahead of today's publication of the research sponsored by the Scottish Government that the minister would announce a bill on fracking. Instead he announced a public consultation will be launched in January, before any decision is made on whether to allow fracking. At the same time, the government will publish its climate change plan and a full strategic environmental assessment. In the meantime the moratorium remains in place. The Minister for Business, Innovation and Energy Paul Wheelhouse said: “The extensive package of research published today will ensure the public has access to a comprehensive evidence base on the potential health, economic and environment impacts of UOG." FoE head of campaigns Mary Church said: "The economic case for pursuing an unconventional gas industry in Scotland simply doesn't stand up, while the risks of doing so could be utterly devastating for communities and the environment. No state has had a moratorium on fracking, looked at the evidence and decided it's a good idea." Scottish Labour is keeping up the pressure on the Scottish Government by lodging a Holyrood member's bill aiming to "change the law to ban fracking in Scotland". Labour MSP Claudia Beamish has launched a public consultation as part of her bid to have fracking banned in Scotland. This follows a vote in the Scottish Parliament last June, in favour of an outright ban. Her Bill has a focus on the climate change implications of fracking. She said: "Scotland relying on fracking for our energy needs will lock us into an energy infrastructure based on fossil fuels long after our country needs to have moved to clean energy. SNP ministers now face an urgent choice - they can work with Labour to ban fracking, or they can work with the Tories to allow drilling under family homes in parts of central Scotland." Firstly, we rightly follow the precautionary principle in terms of safety. Something our industrial heritage has taught us - just ask anyone suffering from asbestosis or other industrial diseases. 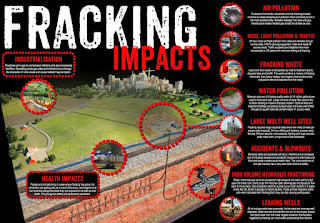 Fracking in the wide open spaces of the USA has highlighted significant safety concerns. In Scotland fracking will take place under people's homes in a densely populated area. Thirdly, we don't need it. We should not compromise Scotland's climate change targets, or the UK's broader commitment to limiting global climate change to two degrees. Scotland should be leading the world in moving to clean renewable power, not aiming to extract ever more inaccessible fossil fuels. The risk is that shale gas doesn't just replace imported gas - it replaces renewables. The third reason alone is reason enough to ban fracking in Scotland. Launching a consultation alongside the climate action plan is therefore a helpful juxtaposition. At the very least the Scottish Government's position is significantly less gung-ho than the UK government. However, an outright ban is now the way ahead, so we can concentrate on a clean energy future. The turnout in local government elections has been declining for a number of years. That's unlikely to change until we reinvigorate local democracy. Today, I was giving evidence to the Scottish Parliament Local Government Committee's inquiry into local government and voting. There was a useful discussion of short-term initiatives to improve registration and voting. However, there was also a recognition that wider local government reform was needed to re-engage voters. In the short-term, there is much that civil society, including trade unions, are doing to encourage registration, postal voting and greater engagement in the political process. Like others, we have found the traditional hustings less engaging than smaller tabletop discussions. As with other council services, registration sections are having to retrench to the statutory basics. None the less there are examples of best practice, such as staff working with schools to register young voters, that could be expanded, if the funding was made available. Creating more of a local media buzz around elections would help, although I am less convinced about the merits of the rapidly disappearing posters on street furniture. Schools are doing positive work through modern studies, but this is not consistently applied across Scotland in a crowded curriculum. Political parties could do more to ensure their candidates are more representative of the electorate. Most obviously in terms of gender, with only 25% of councillors being women. There is also a shortage of working age councillors and more could be done to encourage employers to view civic engagement as something to be valued. The size of councils in Scotland, the largest in Europe, is also a problem. It means they are more remote from the electorate and seem less relevant to local issues. The turnout in some European countries with much smaller councils, based on real communities is impressively high. It also means people would be more willing to contribute their time to participate in local democracy as voters, engaged citizens and stand for election. Being a councillor shouldn't always be a full-time role. Another relevant feature of councils in Europe is that they are often unitary authorities, responsible for almost all local services. In Scotland, we have an array of public bodies and quangos, only loosely brought together through community planning. We have also seen ever greater centralisation, with powers removed from councils and ministers taking greater powers of direction. With powers spread amongst so many decision makers, many at national level, it's not hard to see why people feel disengaged. Democracy is about more than voting every four years. Councils can do more to meaningfully engage with their communities. A range of initiatives from citizens juries to participatory budgeting have been tried, with mixed success. I suspect that won't change until people believe they have real power to effect change in their communities. So, in the short-term we can take action to improve registration and postal voting, by resourcing councils with the active support of civil society. However, in the longer term we have to respect local democracy, with councils that have the powers to effect real change, working with citizens from the bottom up. Only then will more voters deem local elections important enough to fully participate. The health and care sector in Scotland is facing significant recruitment and retention problems at a time when we need to expand the workforce. We need to take action now. Today, I was giving evidence to the Scottish Parliament Health Committee's inquiry into workforce recruitment and retention. It's a timely look at the issue given the problems the sector faces and the need to recruit thousands of extra staff to cope with growing demand. And that's before the uncertainties of Brexit, which understandably concerned MSPs as well. We should start with the data. For the NHS we have pretty good workforce statistics because NHS Scotland uses a common payroll system and therefore ISD can publish a decent analysis of trends. 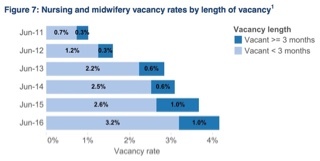 For example, we know that nursing vacancy rates have been growing and currently stand at 2566 WTE. There are similar proportional problems with doctors and allied health professions, including Occupational Therapists. The same is not true for the social care sector. 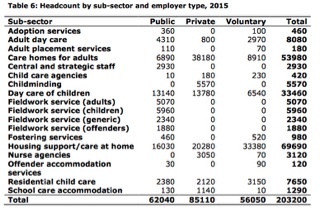 This largely privatised sector is hugely fragmented and data is heavily reliant on registration with the SSSC. The problem with this is that not all staff are yet registered and some important groups, like PA's and childminders, don't have to register. The interaction with volunteers is another complication. We are therefore reliant on partial employer data and our surveys to plug the gap. We do know that many employers are holding high numbers of vacancies and have turnover rates that would make the worst outbound call centres blush. This is also an ageing workforce. In social care the median age in all sectors is in the mid to late forties and younger staff are much more likely to be looking to get out of the sector. There is also gender segregation with men making up only 15% of the workforce. One of the barriers in attracting young men into the sector is the prevalence of part-time working. The data actually understates the problem because the SSSC defines full-time as more than 30 hours per week. In preparation for today's session, I went back and looked at our member surveys in the last 18 months or so. What struck me was the similarity in the concerns of members from low paid home care workers, to professional posts such as district nurses and health visitors. They all point out that these are tough jobs, physically and emotionally, that are getting more complex. The job satisfaction that used to be a feature of the job has been undermined by cuts that leave them with not enough time to care. They also point to limited training and the loss of admin staff support and poor IT systems. Pay and conditions are a big issue, particularly in the social care sector. In Living Wage Week we should be redoubling our efforts to ensure that care workers are getting at least that rate. We also need to tackle poor working practices such as insecure work, zero/nominal hours contracts and the treatment of travel time. As many staff have said to us, why should we work in such a tough job, with registration standards, when we can earn more stacking shelves. Finally, let's look at some solutions. - We must start by valuing the care workforce. Paying them properly with fair work principles being delivered through procurement and sectoral bargaining. That will also help to address gender segregation. - Workforce planning is more of an art form than a science, but we could do better. Not least by widening the scope from the narrow group of professions currently included. We also need to recognise the scope for expanded roles and initiatives like UNISON Scotland's Skill Charter could contribute to this. - Cutting admin support is a false economy, leaving front line staff to perform these functions, usually not as competently. Investment in IT systems and equipment that actually works would also help. - Structurally, in social care at least, fragmentation of providers has to be addressed. Does a country the size of Scotland really need a thousand adult care providers? With a growing demand for health and care workers we need to take action now if the workforce is going to be there when demographic change impacts on many more people living in Scotland. We can make some structural changes and coordinate workforce planning. However, none of that will work unless we value the workforce.